I have a stored procedure that runs a few commands. I don't want these commands to be wrapped in the transaction of the stored procedure. If the 4th command fails, I want the 1st, 2nd and 3rd ones to stay and not rollback. Is it possible to write the stored procedure in such a way that it doesn't all execute as one big transaction? I think there may be some confusion here about a batch vs a transaction. A transaction is a statement or set of statements that will either succeed or fail as a unit. All DDL statements are in transactions themselves (i.e. if you update 100 rows but row 98 throws an error, none of the rows are updated). You can wrap a series of statements in a transaction as well using BEGIN TRANSACTION and then either COMMIT or ROLLBACK. A batch is a series of statements that are executed together. A stored procedure is an example of a batch. 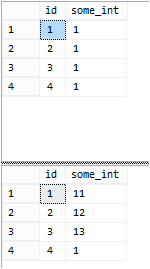 In a stored procedure, if one statement fails and there is error trapping (normally TRY/CATCH blocks) then the subsequent statements will not execute. I suspect your issue is the batch is getting cancelled when an error occurs because either the stored proc itself or an outer scope (like the application or stored proc that calls this procedure) has error trapping in it. If that is the case this is trickier to resolve since you need to adjust how you handle errors at whatever scope is trapping them. As you can see in this above screenshot, there are separate transactions for each of the four statements. The first 3 commit, and the last one rolls back because of the error. Everything in sql server is contained in a transaction. When you explicitly specify begin transaction and end transaction then it is called Explicit Transaction. When you dont, then it is Implicit transaction. if above returns 2, you're in implicit transaction mode. If it returns 0, you're in autocommit. A transaction is ALL or nothing to keep database in a consistent state .. remember ACID properties. Refer to : Is it a bad practice to always create a transaction? This is how stored procedures work by default. The stored procedure isn't wrapped within a transaction automatically. If you want the stored procedure to stop when it hits the first error you'll want to put some TRY/CATCH login in there to return in the event of a problem with command 2 for example. See SAVE TRANSACTION (Transact-SQL) in the product documentation. I want to qualify that individual transactions it the default behavior for stored procedures, because all statements are wrapped in implicit transactions; however, no one should rely on implicit transactions to control the destiny of their code. It is a much better practice to explicitly control the way transactions are handled in production code. separate each of the parts with a BEGIN TRAN and to a check if the transaction was successful. if it was commit it, otherwise do a rollback, since they are all executing from the same level you will be able to commit each section separately without having to rollback all if one fails. Not the answer you're looking for? Browse other questions tagged sql-server stored-procedures or ask your own question. Is it a bad practice to always create a transaction?